1. Am I a good candidate for abdominoplasty? 3. Will my insurance help cover the cost of surgery? 7. How should I prepare for surgery? 8. What will the day of surgery be like? 9. How will I look and feel initially? 10. When can I resume my normal activities? 11. How long will the results last? Some patients have loose skin above the navel. In such cases, the surgeon may make a second incision around the navel so that the redundant skin above it can be pulled down. The excess abdominal skin is then removed. The position of the navel remains unchanged. Skin of the lower abdomen that contains stretch marks may be removed as well. Any remaining stretch marks may be somewhat flattened and improved, but you should not expect a dramatic change in their appearance. The procedure may include tightening of the underlying abdominal muscles using sutures. The subject of risks and potential complications of surgery is best discussed on a personal basis between you and your plastic surgeon. Some of the potential complications that may be discussed with you include bleeding, infection and reactions to anesthesia. 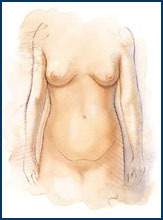 Tissue loss along portions of the horizontal incision is a possibility when the abdominoplasty is very extensive. This complication, which delays healing and prolongs recovery, is more common in patients who smoke or have medical conditions such as diabetes. Revisionary surgery is sometimes helpful in certain instances where incisions may have healed poorly. Following surgery, occasionally, fluid may accumulate under the skin. Removal of this serum is a painless process but may require several visits to the plastic surgeon's office. You can help to lessen certain risks by following the advice and instructions of your plastic surgeon, both before and after surgery. If you are a smoker, you will be asked to stop smoking well in advance of surgery. Aspirin and certain anti-inflammatory drugs can cause increased bleeding, so you should avoid taking these medications for a period of time before surgery. Your surgeon will provide you with additional preoperative instructions. 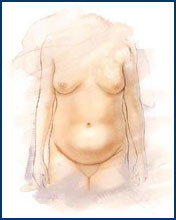 Abdominoplasty may be performed on an outpatient basis. If this is the case, be sure to arrange for someone to drive you home after surgery and to stay with you for at least the next day or two. When abdominoplasty is performed in conjunction with medically necessary procedures such as hysterectomy or hernia repair, a short hospitalization may be required.